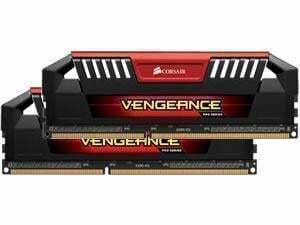 Corsair Vengeance Pro Series memory modules are designed for overclocking on the latest 3rd and 4th generation Intel Core platforms, with eight-layer PCBs and ICs specially selected for performance potential. The aluminum heat spreaders provide superior temperature management and have the aggressive look you want in your gaming rig. XMP 1.3 profiles allow for automatic, reliable overclocking. They’re available in multiple colors to let you match your Vengeance Pro memory to your system’s color scheme. As a bonus, they’re priced to deliver class-leading value, so you’ll have more room left in your system build budget. Vengeance Pro Series is optimized for performance on the latest 3rd and 4th generation Intel Core platforms. XMP 1.3 profile support makes stable overclocking easy and automatic.